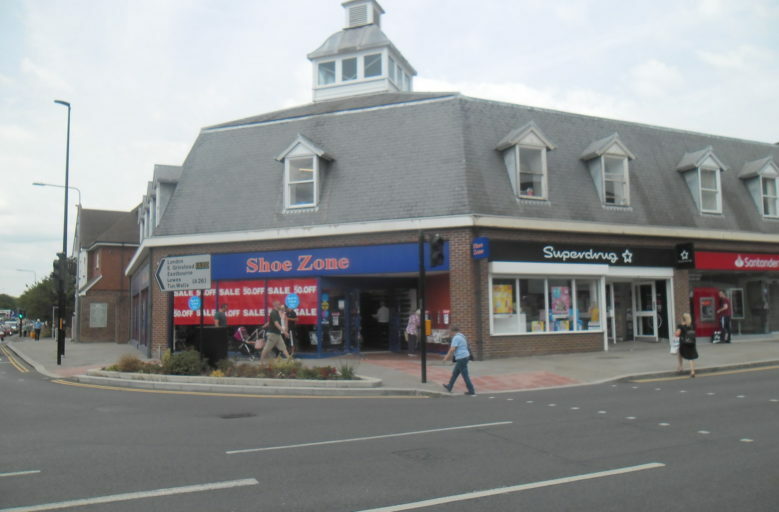 The shop occupied by Shoe Zone on the corner of High Street and Bell Farm Road, Uckfield, is on the market. Shoe Zone has had closing down sale signs in its windows several times over the years and remained in the premises but this time the shop is advertised for lease on the Oldfield Smith and Co website. It is described as one of the town’s most iconic and recognisable buildings occupying an ‘extremely prominent’ position on one of the main routeways into town. It adjoins Superdrug, is opposite Boots the Chemist and Waitrose with Tesco and McDonalds nearby. Accommodation available is on the ground and first floors with a feature tower above. Oldfield Smith says a covered canopy of 22.3m x 7.4m could be incorporated into the shop and there is a ground floor usable area of 150.89 sq m with twin loading doors at the rear to a service yard. On the first floor there is 125.7 sq m of usable space, including a kitchen, and two separate cloakrooms. Oldfield Smith says the premises are considered suitable for a variety of trades, subject to obtaining any necessary consents. A new lease is available, the length to be agreed on a normal full repairing and insuring basis. The rateable value of the shop is £31,250.